GA: Your food is great! How did you get started in the BBQ business? Mark: Thank you, we appreciate the compliment. We had been backyard BBQ grilling for years. While living in Upstate NY our next door neighbor asked if my wife & I could cook a whole hog for the NY State Troopers and their families. We took on the challenge and the event was a huge success. This has become an annual event and deemed the name of the HOGZILLA Pig Roast. In 2008 my wife & I relocated from upstate NY to the Gaston County, NC area. We decided to enter an amateur BBQ competition in Belmont in 2011 and won Peoples Choice for pulled pork. Needless to say this fueled the fire. From there we have enjoyed competing at KCBS and BBQ cook off events and have perfected our BBQ recipes and have been awarded several category winnings. Mark: Thank you. We had been receiving numerous requests to cater events but without a certified kitchen to work out of there would be no catering. So one day after walking into our two car garage, in which we could park no cars, we had the idea to convert it into a commercial kitchen. After a year and a half of work and permitting we now have a NC Health Department certified commercial kitchen and BBQ Pit. GA: What kinds of events do you cater? Mark: We cater any event from a backyard party, weddings, rehearsal dinner, graduation parties, sporting event, corporate gatherings or any special event. We offer on site cooking to bring that BBQ cooking experience to our clients. 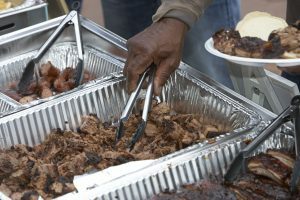 Nothing like having one of our cookers on site for an event to smell the great BBQ flavors in the air. 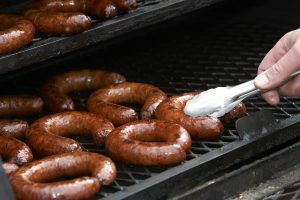 Mark: We offer competition style southern BBQ items with a twist of family recipes handed down, not typically found in the region, such as our house made sausages: Texas, House Blend Fennel and Jalapeno & Cheese. Add to that our kielbasa: Polska and House Blend. We also make home made pierogies: potato & cheese and Farmer cheese filled, sautéed in butter and onions. These are a great compliment to our BBQ Dinosaur bones (HUGE Beef ribs) seasoned with a special rub and slow cooked to fall off the bone tenderness. Our signature award winning HOG Log is also a unique item that is packed full of flavor combining beef, pulled pork, and smoked cheeses all rolled into one dish. GA: What menu items are the most popular? Mark: One of our most requested item is Jo’s two time winning Pulled Pork Brunswick Stew. Our collards are highly requested as well and receive numerous compliments. Beef Brisket is always popular as we feature two style briskets being our competition brisket and authentic Texas style brisket. Our 7-hour baked beans, Mac & Cheese, and Cole Slaw are always favorites. Dessert wise banana pudding is popular, but our southern style bread pudding with whiskey sauce is a huge favorite. 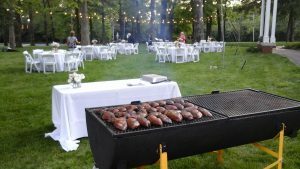 GA: What size events do you cater? Mark: We cater to any event and customize our menu to meet your specific needs. We will cater to events as small as 15 and up. GA: What is the coolest event you have catered so far? Mark: I would have to say the event we catered in Asheville, NC. The challenge here was to prepare the food (10 briskets & 31 racks of ribs) + fixins and travel two hours to serve. It was an awesome event and certainly cool to set up a 22’ buffet and have so many happy faces and compliments.